VOTE ! VOTE ! VOTE ! A champion of education, small business, entrepreneurship, and “Prosperity for All”. Listed in the Marquis Who’s Who in America and Who’s Who in the World. Named as one of the “Notable Georgians 2015” by Georgia Trend Magazine. Alumnus of Leadership Georgia and a Charter Member of TiE. 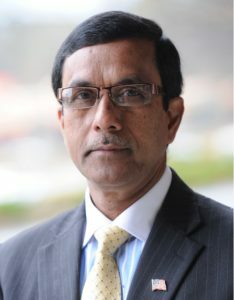 Dr. Mohammad Ali Bhuiyan is a husband, father, homeowner, small business owner, academic administrator, professor, and economist who moved to Georgia 30 years ago. Cobb County has been his home for the past 16 years. He has been married to his wife Shamima for 30 years. They have one grown son. Mohammad Ali came to America from Bangladesh as a graduate student in 1986 to attend Georgia State University. He received a Ph.D. degree in economics/trade, two MBA degrees (one from Indian Institutte of Management – Bangalore), and advanced leadership training from Harvard and MIT. He has been listed in the Marquis Who’s Who in America and Who’s Who in the World. He is an alumnus of Leadership Georgia and a Charter Member of TiE. He was named as one of “The 100 Most Influential Atlantans of 2014” by the Atlanta Business Chronicle and as one of the “Notable Georgians 2015” by Georgia Trend Magazine. He and his wife became citizens of this great country in 2000. The “American Dream” has become a reality for them. A new kind of Republican candidate who understands and can work with all people. Government spending, waste, and taxes are out of control. Washington has become a center of powers to serve and protect special interest groups and no longer working for ordinary citizens. We all need to say “NO” to this broken system and send an honest and experienced business/education leader to work for ordinary citizens. 2015 – Present: CEO, Leadership Needed Foundation, Inc.
1993: Graduated from University of Florida, Ph.D. I have been a lifelong champion of education, small business, and “Prosperity for All!” I am announcing my candidacy to replace Congressman Dr. Tom Price (R-Roswell) who has been nominated by President-Elect Donald Trump as Secretary of Health and Human Services. I am a “Different kind of candidate who understands and can work with all people.” I have a long history of giving back selflessly with honesty and integrity. I am a husband, father, homeowner, small business owner, academic administrator, professor, and economist who moved to Georgia 30 years ago. Cobb County has been my home for the past 16 years. I have been married to my wife Shamima for 30 years. We have one grown son. I received a Ph.D. degree in economics/trade, two MBA degrees and advanced leadership training at Harvard and MIT. I am an alum of Leadership Georgia. Being a man of deep personal faith and family values, I believe in one God and as a Muslim I believe in Moses, Jesus, and Mohammad (peace be upon them) who are parts and lineage of the great prophet Abraham. Above all, I am an American first and fully committed to America’s security, prosperity, individual freedom, and greatness. America is a country of immigrants. I came to America from Bangladesh as a graduate student in 1986 to attend Georgia State University. My wife and I became citizens of this great country in 2000. The “American Dream” has become a reality for us. My ties to Georgia are deep. In addition to living here for 30 years, I have served on numerous local, national and international committees and nonprofit boards. I have been a member of Rotary Club and other community organizations. I was humbled to be named one of “The 100 Most Influential Atlantans of 2014” by the Atlanta Business Chronicle and as one of the “Notable Georgians 2015” by Georgia Trend Magazine. The City Council of Savannah proclaimed May 31, 1996 as “Dr. Mohammad Bhuiyan Day” in recognition of my contributions to the community while serving as a professor at Savannah State University. The State of Georgia also issued a proclamation recognizing my leadership in promoting minority entrepreneurship. Over the last thirty years I have traveled to more than fifty countries meeting with citizens, heads of state, Nobel Peace Laureates, government officials, politicians, educators, and business leaders. I understand the complex political, cultural, religious, and economic issues around the world. This experience will help me to promote a strong defense posture and ensure our country’s leadership around the world. I have over twenty years of executive level experience. I have served as Chief Executive Officer, Executive Vice President, Vice President, Dean, Chair, Director, and Endowed Chair Professor in academia, business, and the non-profit organizations. I also worked as a marketing executive and consultant for British American Tobacco, the Food and Agriculture Organization of the United Nations, Pfizer, and the United Nations Development Program. I was the founding director of the Opportunity Funding Corporation’s Innovation and Entrepreneurship annual conference. This nationally-renowned conference featured young budding entrepreneurs seeking funding and feedback from established business leaders with a business plan competition, and served as a catalyst to spur entrepreneurship programs at universities across America. In connection with these conferences, I led an annual National Policy Forum on Innovation, Entrepreneurship, and Higher Education that included university system heads, chancellors, presidents, Fortune 500 CEO’s, successful entrepreneurs, high ranking military officers, and other national and international leaders. I have been interviewed on economic, higher education, and world peace related issues. I have appeared on ABC, CBS, NBC, and CNN.